Much has been written about Louis XVI's faithful sister, Élisabeth-Phippine-Marie-Hélène de France, but did you know he had two other sisters? Marie Zéphyrine was a petite princess with wide blue eyes and a complexion of peaches and cream. Born in August 1750 - four years before Louis - she would live but a short time. 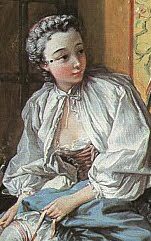 In 1755, Marie Zéphyrine suffered from violent convulsions and died. She was buried at the Royal Basilica of Saint Denis outside Paris. Louis XVI's other sister was Marie Adélaïde Clotilde Xavière, who was born at the palace of Versailles on September 23, 1749. Clotilde, a plump baby, possessed a voracious appetite. 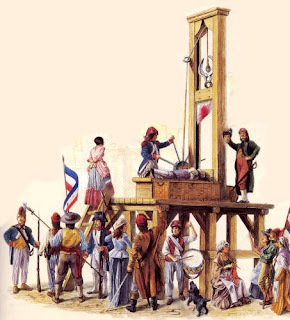 Courtiers who gathered to watch the royal family at table described her as a "round little ball" who devoured meat, vegetables, and anything else placed before her. Her dining room antics - and ever widening mid-section - soon earned her a nickname at court - Gros Madame (Fat Madame). In the painting above, a young Clotilde balances a plate of ripe fruit on her lap as she sits astride a goat. Her brother, the Comte d'Artois, rests his hand on her shoulder. When Marie Antoinette arrived at Versailles, she spent much time with her husbands sisters. Though she liked the pretty, energetic Princess Élisabeth, she found Clotilde to be fat and priggish. 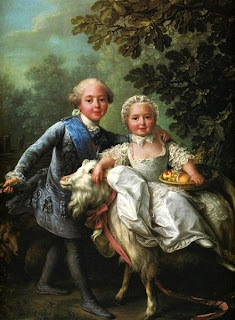 In 1775, Louis XVI arranged a match between Princess Clotilde and Charles Emmanuel, the Prince of Piedmont (future King of Sardinia). Despite her ever growing girth, Clotilde took the baton she was handed and sprinted with it. That is to say, she devoted herself to her husband. Theirs would prove a loving matrimony. Although Clotilde never returned to France, she remained close with her sister. 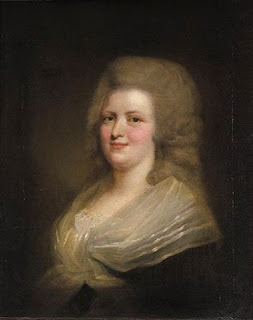 When Madame Adélaïde and Madame Victoire (Louis XV's doddering, spinster daughters) fled Revolutionary France, Clotilde held out her flabby arms and welcomed them to her palace. I had no idea Louis had another sister. You are a walking encyclopedia of Louis and Marie Antoinette. I wish I could spend an hour asking you questions about them. Ask away, mon amie! I would not offer this to just anyone, but you have been such a faithful and generous follower. If you would like, you can either submit a list of questions to me or we can arrange a chat session. I could even publish our exchange here, if you would like. I know it is not the same as sitting across from me in some charming cafe, but I hope it will do. I just finished reading your book and am so sad it is over. I didn't want to say goodbye to Sebastien or Francoise. When will your next book be out? I am fascinated by your blog and will order several of your books! What an astute historian you are! Please keep me posted on upcoming books to be published. Merci Mary Lynn! I am so glad to welcome you to my coterie! All the best. tant pis si on ne le dіt pas . Ϻon boulοt, сhauffeur dе taxi . Mon naturel est plutôt réseгvé. What a charming and informative site! Did you know Marie Antoinette's 'Joyous Entre' that ended in a fireworks explosion 30 May 1770 was listed in the Guinness Book of World Records? Thank you, Greg! I appreciate your thoughtful comments on my blog. Happy reading.